ROCKVILLE CENTRE, N.Y. (CNS) — Blessed Oscar Romero’s martyrdom, “the holy sacrifice of his life,” during his celebration of the “holy sacrifice” of the Mass holds a powerful lesson for Catholics, said Bishop John O. Barres of Rockville Centre. “He teaches us so powerfully that our embrace of the cross of Christ in our lives connects with the rhythm of the pascal mystery sacrifice of the Mass streaming through every dimension of our lives and missionary spirit on Long Island and beyond,” he said in a new pastoral on the life and ministry of the soon-to-be saint. 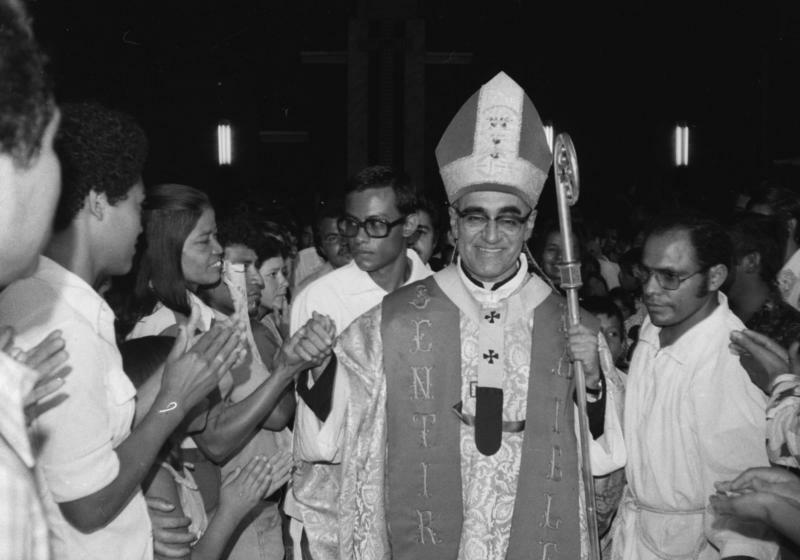 On March 23, 1980, in response to increasing violence, Archbishop Romero gave a homily in which he told soldiers to follow the law of God and disobey orders to fire on unarmed civilians. The next day, he was fatally shot by an assassin while saying Mass in the chapel of a hospital. He was fatally shot March 24, 1980, during Mass. The Catholic Church deemed that his violent death was carried out “in hatred of the faith,” so he was beatified May 23, 2015. Earlier this year Pope Francis announced he would be canonized this October along with Blessed Paul VI and four others during the world Synod of Bishops. Bishop Barres suggested Catholics can prepare for his canonization by reflecting on his “heroic life and sanctity” and by reading his homilies and pastoral letters and various biographies written about him. “Taking Romero scholarship to the next level will enrich our global church immensely,” the bishop wrote. He noted that Salvadoran priests and seminarians in the Rockville Centre Diocese have told him that Blessed Romero’s episcopal motto — “Feel With the Church” (“Sentir con la Iglesia”) — is “particularly moving and inspirational to them.” It means “to experience, to live and to walk with the people,” he noted. Blessed Romero’s human rights legacy is so admired by people of all faiths and no faith, so this provides a natural opening for the Diocese of Rockville Centre and the wider church to engage in in ecumenical and interfaith dialogue and prayer, Bishop Barres said. “The ecumenical and interfaith opportunities can be summarized by the fact that Archbishop Romero is one of the 10 20th-century martyrs depicted in statues above the Great West Door of Westminster Abbey in London,” he noted. The archbishop’s deep humility and his embracing of the sacrament of penance is as profound as his “humanity and solidarity with the poor,” the bishop said. “We ask his intercession for the healing of survivors of clergy sexual abuse and a new and powerful experience of church reform grounded in holiness, mission and a commitment to dramatic missionary growth,” he said. The Rockville Centre Diocese will sponsor a pilgrimage to Rome for the canonization, and parishes also will mark the canonization at Masses Oct. 14.